Understanding how quality score works and how to maximize your quality score is imperative to successfully advertising through Google AdWords. Quality score is important because it works as a metric for Google to measure the relevance of your ad to the users who search for your keyword. The quality score of your keyword is used to determine not only your ad rank but also the cost of your campaign. This means, by optimizing the quality score of your ads, you can lower your cost per click (CPC) and increase the click through rate of your advertisements. 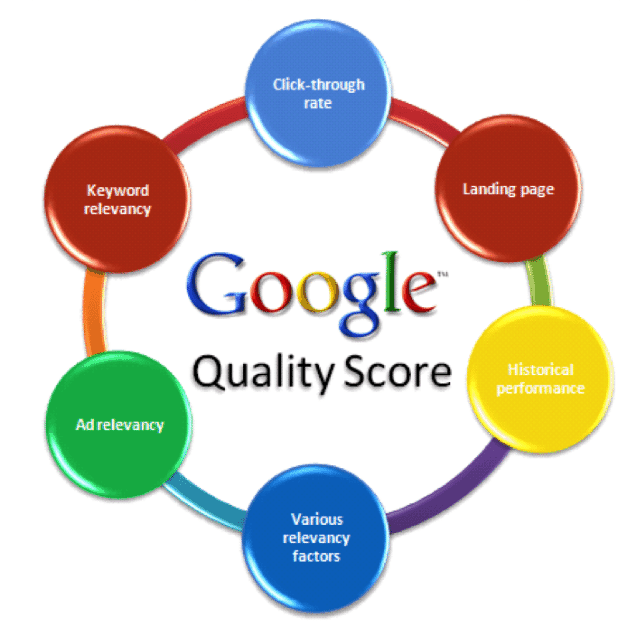 Quality score was created by Google so it could keep track of the relevance of your ads to the users who are searching for your products. Before quality score existed, AdWords was basically an auction house where the best ad ranks went to the highest bidder, which enabled big-budget advertisers to blanket search results with irrelevant ads. When quality score was implemented it opened the door for advertisers with smaller budgets to reap the rewards of a well-run, pay per click (PPC) campaign. It is important to note there are two different quality scores for every ad on AdWords: the Search Network Quality Score and the Content Network Quality Score. 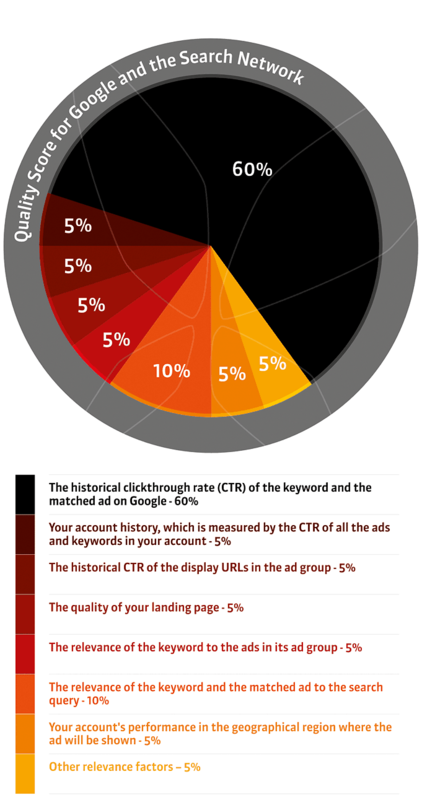 This graphic* breakdowns estimates of how Google’s algorithm determines the Search Network Quality Score which is our focus. Now that you know the importance of quality score and how it’s determined, let’s look at what actions you can take to improve your search quality score. The click through rate (CTR) and historical CTR of your ad/keyword pair is the greatest factor in determining quality score. The first thing to understand is your CTR is normalized, which means the CTR is evaluated based on the performance of other ads that, have previously or currently, share your position. Increasing your CTR by paying more does not equate to a higher quality score, and while bidding more on keywords will allow you to move up in adrank position it won’t help you if your ad doesn’t get a better quality score than the ads that were there previously. A better method is to focus on increasing CTR by making the ad as relevant and attractive to users as possible. When attempting to increase CTR, always use a combination of highly optimized action words and a good call to action. A well-crafted call to action is probably the most critical ad text to include, and not having one will most likely hurt your quality score. Here is a great set of examples from our friends at red fly. Historical CTR is a tougher shell to crack. When factoring in quality score, Google looks at the CTR of all your past and present campaigns, which means building a strong CTR and sustaining it throughout your campaigns makes future ads much more cost effective. But, is there anything you can you do now? One quick method is to bid high on your company or brand name. This can create a big boom in historical CTR, because your ad will almost always be what a searcher is looking for. Eventually you’ll pay only pennies per click, and your normalized quality score and historical CTR will improve drastically. It’s imperative to understand how landing page quality works, as it’s measured in a very unique way. Google has thousands of Ads Quality Raters – real people who rate ads and the value of their associated landing pages. To improve landing page experience, Google suggests you focus on relevant and original content, transparency, and ease of navigation. A positive landing page experience is necessary, because it helps gain the trust of customers and keeps them coming back. Additionally, a high-quality landing page makes it easier for visitors to purchase your products, sign up for a mailer, or perform whatever action your ad was designed to promote. Another way to increase the quality score of your landing page is to include your keywords in the title tag and throughout the copy of your landing page; just remember it has to pass the eye-test from a person, not just the Google algorithm. The ideal (although time consuming) situation is to create a landing page for each individual keyword. For those of us who don’t have extra hours every day, a landing page for each adgroup can be all you need. Luckily Google has given us some information they use when determining “landing page experience”. Is the purpose of your site clear? Is your site actually useful to visitors? What does your site offer that other sites don’t? Is your business and contact information easy to find? Are you upfront about any information you’re collecting from visitors? Can people easily tell what’ll happen when they perform an action on your site? Is it easy for people to find what they’re looking for? Does your site have too many links that might confuse people? Can people easily find information to learn more or answer questions? Negative keyword research allows you to cut out irrelevant searches and truly hone your sights on users who want your products or services. By aggressively using negative keyword research you can improve CTR and decrease the bounce rate of your ads. Negative keywords are important to keeping a high quality score, making hyper-relevant ads, and they can really pay off in the long run. To understand the geographic performance of your campaign the first step is to run an AdWords Geographic Performance report, which gives you detailed information on your ad’s performance in markets you are targeting and highlights where you can improve. To expand geographic performance, create a dedicated adgroup for underperforming geographic areas. Keep in mind, a poorly performing adgroup can lower the quality score of your other adgroup campaigns, so if you can’t make improvements, consider removing it. Google holds the secret of the AdWords quality score algorithm very close to its chest, but that doesn’t mean we can’t figure out and understand many of the factors that go into quality score and how to make them pay off for your business. By taking the time to work through the steps above, you’ll enjoy the full potential of your PPC campaign.